While screws have been steadily stealing the show from nails in recent decades, nails will always have their place around the home. They're still preferred for a lot of structural work and can't be beat for trimwork, flooring, roofing or paneling, among other jobs. Nails drive quickly, hold reasonably well and can be installed so they're barely visible, if desired. When choosing nails, look for the right type, size and material (including special coatings) for the job at hand. Roofing nails are designed expressly for anchoring shingles to roof decking. When nails aren't specified by the penny system, they're simply noted by their length, in inches (what a concept!). Most nails are technically called wire nails because they're cut from long strands of solid-metal wire. 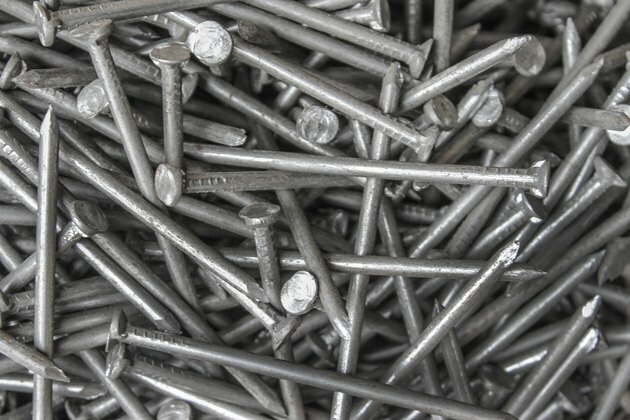 The most common nail material is steel. Steel nails for indoor projects may be plain steel (called bright) or they may be coated with resin or other materials to make them easy to drive into wood; these are often called sinkers. Ordinary steel nails for outdoor projects—or any application requiring corrosion-resistance—are usually galvanized to forestall rust and corrosion. 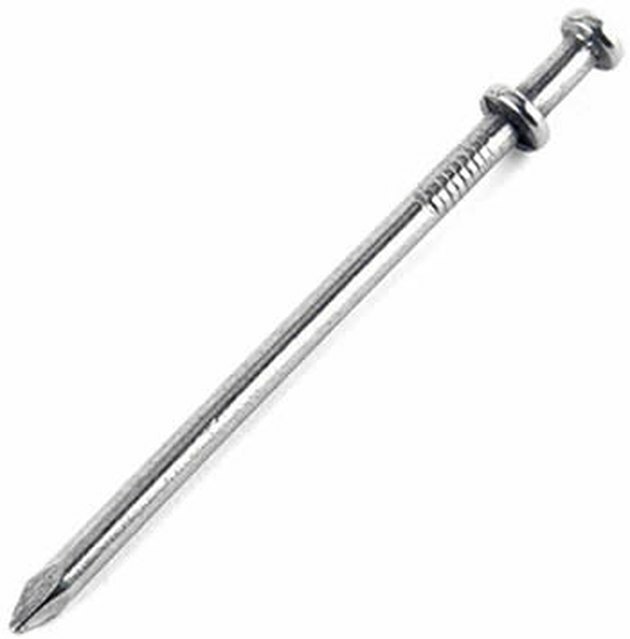 Smooth galvanized nails are electroplated and offer moderate corrosion-resistance. 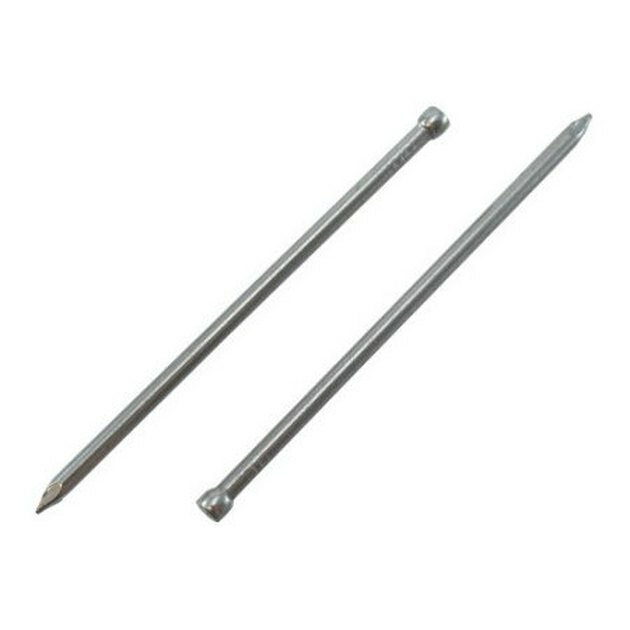 Rough, dull-gray galvanized nails are hot-dipped; these are best for outdoor exposure and are suitable for use with pressure-treated lumber (electroplated nails are not). Specialty nail materials include stainless steel, copper and bronze. Stainless steel offer the best combination of strength and corrosion-resistance. Use them for coastal environments, pressure-treated wood, cedar or redwood (they're the only nails that won't discolor these woods) or anywhere that strength and longevity are critical. Copper and bronze nails are used for fine work with copper and bronze materials and for very high-end roofing jobs. Common nails are standard, heavy-duty nails for wood framing and other structural work. Use them to build frames for walls, floors, ceilings and roofs. As a general rule, if you're building with "two-by" (1 1/2-inch-thick) lumber, you should be using common nails. The most widely used sizes of common nails are 16d, 10d and 8d. Box nails are the thinner, weaker cousin of the common nail. They're generally designed for basic wood construction using "one-by" (3/4-inch-thick) lumber or sheet materials like plywood. Because they are thinner than common nails, box nails are easier to drive and tend to split wood less readily. They're also easier to bend and break while hammering them. Use them for basic construction joints that don't require structural strength. Also called finish_ing_ nails, finish nails are thin and have small, rounded heads that sink smoothly into wood. They are the standard choice for all types of wood trimwork, such as baseboards, window and door casing, and crown molding. With careful hammering, you can drive a finish nail flush, or even slightly below the surface, with a hammer alone. But the best way to complete the driving of a finish nail is with a nail set, a pointed punch tool that you tap with a hammer to drive the nail slightly under the wood surface. You can then hide the nail head and hole with wood putty, if desired. A casing nail is similar to a finishing nail but it has a slightly thicker shaft and a cone-shaped head. It is used for heavier wood stock, such as large baseboards and exterior case moldings on windows and doors, where greater holding power is needed. Brads are similar to small finish nails but are typically thinner and weaker. They're great for fastening thin strips of trim or for tacking together glued wood parts to hold them until the glue dries. Brads may have rounded heads (like finish nails) or small flat heads. Brads are the most common type of nail used by craft or DIY-size nail guns. You can guess what roofing nails are used for. They're short—about 1 to 2 inches long—and have wide flat heads for holding down shingle materials without damaging them. 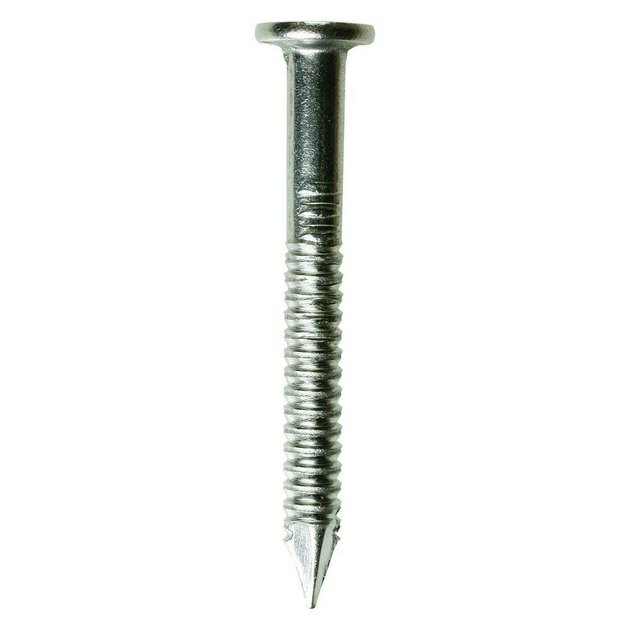 Roofing nails are commonly made of galvanized steel but can also be aluminum or specialty materials such as stainless steel and copper. 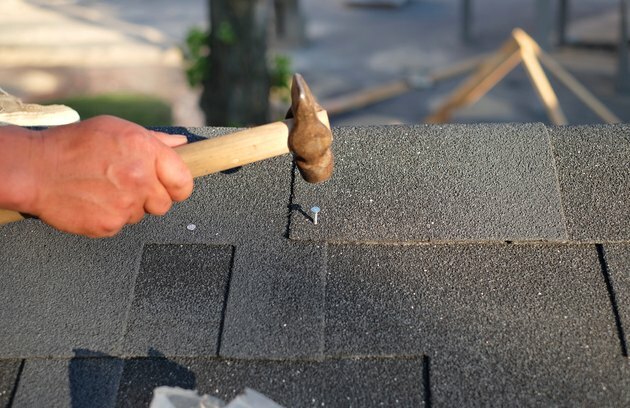 Standard roofing nails are designed for composition (asphalt) shingles and wood shingles and shakes. Nails for metal roofing have a neoprene gasket under the head to keep water out of the hole made by the nail. Stout, hardened-steel masonry nails can be driven into concrete, concrete block, brick, mortar and other masonry materials. They may have smooth shanks or shanks with rings or flutes for easier driving and more holding power. Masonry nails are useful for tacking objects to brick or block walls, especially if the object will be stationary and hang straight down, like a decoration. For structural attachments or objects that require pullout resistance, it's preferable to use concrete screws, which hold better and are easier for beginners to install. Several types of nails have rings, ridges or barbs on their shanks to resist pulling out (and, boy, do they hold!). Ring-shank nails are also called annular nails and are commonly used for installing subflooring, flooring underlayment, house siding and paneling. Nails driven into lumber are vulnerable to getting pushed out by the expansion and contraction forces of the wood; ring-shank and related nails help resist this action to keep materials tight against the supporting lumber. Drywall nails are one type of ring-shank nail, used to secure drywall panels to wood framing members. While these are commonly found in older houses, most drywall today is fastened with drywall screws. Traditional cut flooring nails have tapered square shanks, similar to horseshoe nails. They are used to "blind-nail" hardwood floor or to "face-nail" pine plank flooring. They are sold individually (for hand-driving) and in strips for use in nail guns or flooring nailers. Other types of flooring nails have spiral-fluted shanks (for holding power) and small heads for a finished look when they are face-nailed. The nail with two heads, a duplex nail can be driven all the way down to the first head—so the materials are nice and snug—but the second head remains above the surface so it's easy to grab with a hammer claw or pry bar when it's time to remove the nail. Duplex nails are most commonly used for building wooden concrete forms but are handy for any type of rough temporary construction. What Kind of Nail Gun Do You Use to Work on 2X4 Boards? Why Use a Double Headed Nail? What Size Nails Do You Use for Framing?